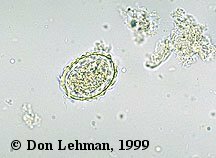 Ascaris lumbricoides is one of the most prevalent intestinal parasites. Infections are diagnosed by detecting ova in the feces. Fertilized ova, shown at right, are oval and measure about 50 by 70 µm. The ova are bile-stained and appear yellow in saline wet-mounts. 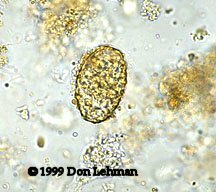 Infertile ova can also be found in the feces; they are more oval than fertilized ova and measure up to 90 µm in length. These ova have a more amorphous appearance. Both fertile and infertile ova can be corticated or smooth.